One of the basic everyday household tasks is ironing the clothes. People always want to keep their clothes neat and well-looking. Sometimes, people consider this household activity as a therapeutic method. But for everyone, ironing clothes is a very tedious task, and it requires a lot of efforts and time. This guide will help you to select the best Ironing board appropriate for your home. Through the endeavor of man to enhance the technological advancement, a lot of innovations have been developed to enhance the Ironing experience of the human. They have developed ironing boards that easily make the ironing chores without the fear of those cluttered stitches. The ironing board comes with a cushioned surface on which garments are placed for ironing. These boards are made from the heat-resistant material. The pad has holes which allow iron’s steam to permeate your clothes. Besides, these boards also come with a lot of added features which make the ironing process much simpler. It has sleeves attached to the board which is used whenever you are ironing clothes with sleeves and small stuff. It also equipped with an iron-rest attached at the end of the board build using heatproof material which can easily hold the iron securely. However, buying a perfect iron for your home is not an easy task. You have to consider different factors while selecting the best iron for your home. If you have a small space in the house, you can also use the ironing boards as a sofa table to corral newspapers, remote controls, and various other items. Some people also use the board to place plants in the front of a window. It is a simple way of adorning the home, and it surely enhances the decor of the room. Most people are now using steam irons. If you are also using the steam iron, you should choose the ironing board which has a mesh construction. The reason behind this is the steam will easily pass through the ironing board. This will prevent the ironing board cover to turn soggy by preventing condensation. Besides this, the cover of the ironing board should offer you a smooth surface to facilitate an easy ironing process. It should be secure and not slippery. An elasticated cover, with one or two cross-ties at the center of the board. It won’t move when you are ironing. A metalized ironing cover will reflect the heat. This will smooth the underside of the garment. You should consider the shape and size of the ironing board. It largely depends on the what you normally iron. A smaller board will be easier to manipulate and store. However, it will generally require more re-positioning of the clothes while ironing. A good taper on the pointed end can be useful for reaching into corners. 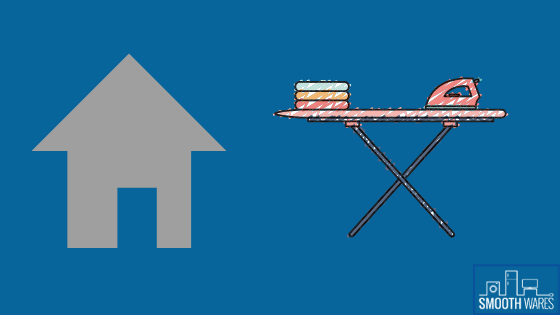 The fold-able or the portable ironing boards are the most common. They have scissor type legs, and the height can be adjusted, either you want to sit or stand while ironing. You can find this kind of ironing board in everyone’s home. It comes equipped with extended legs which can be extended for use and can be folded when not in use. As these are fold-able​, you can carry the boards to the other areas of your house where you want to do the ironing. After completing, then just stashed away the ironing board. These boards can be adjusted as per your liking whenever you wish to iron the clothes whether in a sitting position or in standing up position. The height can also be adjusted and can be used by the smaller members of your family. This can be the best option for your house if you have smaller members in your house. This short-leg ironing board can be placed on top of the table. These boards are very easy to move around and can be used in poky spaces. As this board is small and very compact, they can be easily stored in constricted spaces. This is generally installed in walls and free spaces in the homes. This can be folded out when not in use. It saves a lot of space which is best if you are living in a small house or apartment. It can be placed on walk-in closets or other compacted spaces. Well, this can also be used in bigger homes because this is convenient and very easy to install. This type can be moved in different angles to acquire better fitting position for better ironing experience. This is generally a built-in cabinet for storage of the iron, spray, starch and other stuff. The large cabinet is usually installed into the wall and come equipped with drawers, and ironing board. This type of board is usually installed on the doors. It is nailed on top of the door and can be shifted easily. When you need it, just fold it down from the door. This board saves space. Searching for the best and perfect board for your house is simple. Not all people require a high-end unit. How to choose an ironing board depends on your budget and your expectations after determining the features that you need. Now, you can go online to find the board that suits your needs and budget. With well-ironed dresses, you can easily create a good impression on others. But the challenging task here is to make the clothes wrinkle-free. To eliminate the troubles of ironing, you can use ironing boards, which smoothen the ironing process. You can easily remove the wrinkles on your clothes on their cushioned surfaces. Apart from that, you can make your ironing process less stressful. The counter top models and multi-height adjustment models are the most demanded ironing boards.